Vegan in Bellingham: Revisiting the Soy House: 414 Bakerview Road, still one of Bellingham's Best Places! Revisiting the Soy House: 414 Bakerview Road, still one of Bellingham's Best Places! I will admit I get attached to restaurants. I have my favorites and I tend to rely on them, to become emotionally involved in a way, to maybe even get a little . . . a little dependent. Yes, I have my favorites and I would be lying if I said that I wouldn't be more than a bit disappointed if they were to change from being something I loved into something different than what I thought they were. Luckily, with the Soy House, there is no reason for me to ever be afraid or insecure--the only thing that changes about the Soy House is that it gets better and better. And when you consider that they started out perfect, that is really saying something. The Soy House is my absolute favorite in terms of consistency, kindness, and phenomenal food. I had not been there in a long time and then this past New Year's Day, my husband, mother-in-law, and I got a craving for the place and decided that having an early dinner there would be a perfect way to kick off the New Year! Their menu was different than the last time we were there and not only was it even more visually appealing, there were even more options than before. Now you may remember that I am a huge fan of the Banh Xeo, which is what I usually get and always love, but this time I decided to try something different and ordered the garlic tofu dish while my husband ordered a vegan version of the Pho with tofu. Do you ever have one of those meals that is so absolutely satisfying and delicious that it simply wipes out and replaces the memory of every bad meal or disappointing dish you have ever eaten? This dish was so amazing that I was temporarily transported into a world where all food is always wonderful, fresh, flavorful and makes you feel good and happy. While eating I had visions of how the world should always be and taste and feel. My husband who has a thing for Pho was also overjoyed to find a meat-free version that he absolutely loved of one of his favorite dishes. I had a taste of his as well and agreed it was fabulous. We ate until our hearts' content and still had leftovers to take home and happily enjoy later. As usual, the atmosphere was wonderful, the people friendly, and the dining experience relaxing and perfect. The Soy House is a place I can let myself fall in love with over and over again without fear of having my heart broken later. It is deserving of all the good things people say about it. If you are reading this post and have still for some unknown reason never been to the Soy House, you simply must go. Trust me, you will not be disappointed. You should try the vegan pho at Pho99. It's delicious. Try the pizza next time you're there. We had the green curry w/ tofu and no cheese. It was outstanding! Ive never gone! I need to check it out! thanks for the suggestion! I love Soy House! I always get the tofu pho and add veggies. They add so many veggies! Broccoli, green beans, zucchini, carrots! I should probably try something new the next time I'm there, but I love the pho so much I haven't yet. Oh my, that dish you had looks amazing. Guess it's time to go back!!! I have never been to Pho 99 and I had no idea they had anything vegan. Thanks for the tip! that looks so delicious. I'll have to try my hand at vegan Pho sometime. 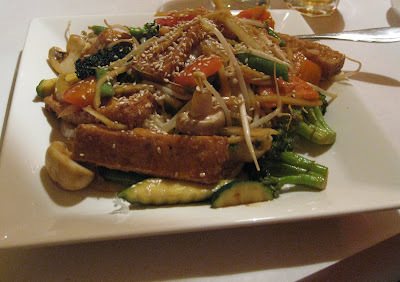 The garlic tofu dish looks amazingly delicious! So sad ... I live only a few blocks from Soy House and never thought to try it! We're having some friends for dinner on Tuesday, maybe I'll suggest we go there ... as I haven't figured out what I'm cooking, anyway! Mmm ... I can't wait! yummm. we just went to soy house for dinner and were quite impressed. I had Pho for the first time. My BF had veggies and rice with a garlic sauce. They even knew what vegan was (Thanks veganinbellingham). I can't wait to try the sandwich..pizza..etc next time. p.s. it was a very clean place too. Oh I am so glad you enjoyed it! They are so wonderful, I can't wait to eat there again! We tried the Vegetarian Pho. They don't put any fish sauce in their veg items do they? My husband "thinks" he can always taste it, but I can't imagine why they would. Since you are an expert there, I thought I would ask. We also tried the Banh Xue.....oh my! So good. And, you can't beat Deep Fried Tofu! Soy House blows away Pho99. The food is always fresh, really tasty, and consistent. It's a family run restaurant - Mom is the cook. I love that it's open on Sundays. I highly recommend Soy House! I LOVE LOVE LOVE the Soy House! Stopped by to pick up a pizza yesterday and it was soooo tasty. The food is always delicious and amazing. Can't wait to go back! Had dinner with my husband here this past Friday--we both had a craving that had to be satisfied! Food was fantastic and atmosphere wonderful. The Soy House will always be my favorite!! !